From Manaus we took a three hour bus journey into a random small village situated on a tributary of the Amazon River called the River Uburu. From there we crammed ourselves into a narrow wooden motorboat and sped off into the rain for a two hour trip up the river. 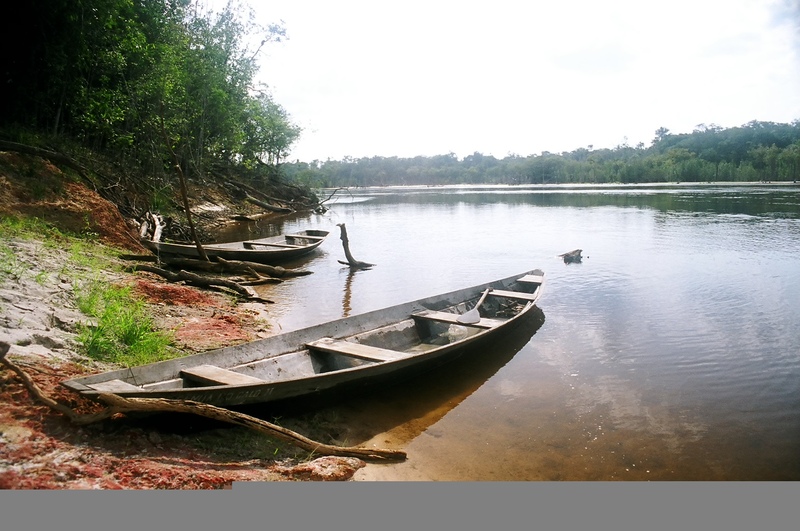 The ride was fascinating as the serpentine river meandered along the jungle shores. It was the “drier” season by Amazon standards and all along the banks endless tangles of barren intertwined tree roots carved through the exposed banks of sand and into the shallower than usual water below. After a couple of hours there appeared out of nowhere a small campsite maintained by an indigenous Caboclo family. I don’t know how the guide found it because for hours everything on the banks looks essentially the same. We strung up our hammocks in the open air on some poles under an open thatched canopy for the night. The jungle for all its fascinating flora and fauna is unbearably hot, intensely humid, and full of voracious bugs but an utterly astounding place to be nonetheless. During the days we trekked and trekked hours through the Jungle. Toucans sing high above in the trees, the sun is bright but sometimes barley visible beneath the shadows of the thick canopy. The vegetation is thick even with a machete to hack away a trail. At one point our guide dug out a giant hairy tarantula from beneath a tree stump, it had menacing sets of redundant eyes and fangs to match. He showed us rubber trees, camphor trees, plants containing quinine, and demonstrated which trees you could hack away at the bark and drink the milk-like sap. The next day we spent hours fishing for piranhas with makeshift fishing poles made of sticks, fishing line, and chunks of raw chicken for bait. We probably caught 8 or 9 piranhas that we later ate for dinner. The guide told us the fishing would be good because the water level was lower this time of year and the fish would be more concentrated. 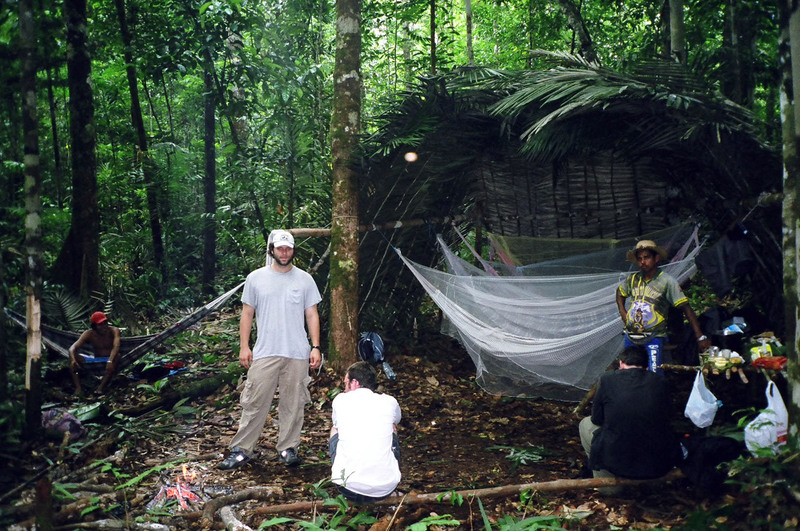 Not a whole lot to do at night once we set up camp deeper in the jungle but peer into the dark vast wilderness. One tends to do a lot of introspection in the Jungle, I felt one with the jungle and indeed it clearly seemed the jungle felt one with me, at least the ubiquitous bugs felt one with me. I was bitten by a quite a variety of the pesky little bastards....swarms of mosquitoes, giant horse flies with long snouts, annoying little sand flies, ants, and an extensive array of little weird jungle bugs I had never seen. I laid in my hammock at night getting bitten over and over despite the hole ridden mosquito net I had wrapped around my hammock like a cocoon. Every night it was quite hot and I drifted in and out of sleep all night in the humid stagnant air. I often lay awake swinging back and forth in my hammock in a somewhat futile attempt create a small breeze. I periodically smacked bugs off my face and arms as I made an effort to forget all those unusual bug borne tropical illnesses I had so eagerly learned all about in Residency.....the interesting list of exotic jungle diseases goes on and on..... Chagas disease, malaria, schistosomiasis, yellow fever, leishmaniasis, and various parasitic diseases among others. One morning I awoke to the Australian in the hammock next to me jumping out of his hammock and angrily cursing the loud swarm of horseflies biting him, as their long snouts were able to penetrate the fabric of the hammock from below. It was quite hilarious and we all got a good laugh at his expense. Rio and all Brazil for that matter is know for the bacchanalian festival of Carnival. I wasn’t there the right time of year for the actually festival but I did visit the “Sambodromo” where the parade takes place every year. I also went to a “samba school” practice. Each year 14 neighborhoods parade down the Sambodromo with a large float, and hundreds of performers, dancers, and musicians. The parade is only held once a year, but the rest of the year the different neighborhoods hold parties every weekend to practice their routines at the “samba schools”. The one I went to was basically what amounts to a large red and white decorated warehouse in the Salgueiro neighborhood. Inside the people party late into the morning as dancers in elaborate costumes perform and a massive percussion troupe bangs away to the loud singing. The place is electric and the caipirinas are cheap and strong. Elsewhere in Rio the nightlife is amazing, I especially liked the bohemian neighborhood of Lapa. Lapa is in a historic part of Rio full of colonial architecture where endless masses of people wander the streets hopping from bar to bar. The local guide told us he had just resumed giving tours of the slum after a 2 week hiatus sparked by a recent rash of assassinations and police raids that had enveloped the favela prior to our tour. Two weeks earlier the police had infiltrated the favela and staked out the local drug lord. He was killed in the attempted arrest and a local power struggle ensued as several gangsters fought to become the next drug lord. Two more were killed until someone finally prevailed and a new power structure was established with a new drug lord. As we walked around the guide spoke of the local problems. Favelas he told us are essentially illegal settlements built by squatters who build shacks wherever they can find space. 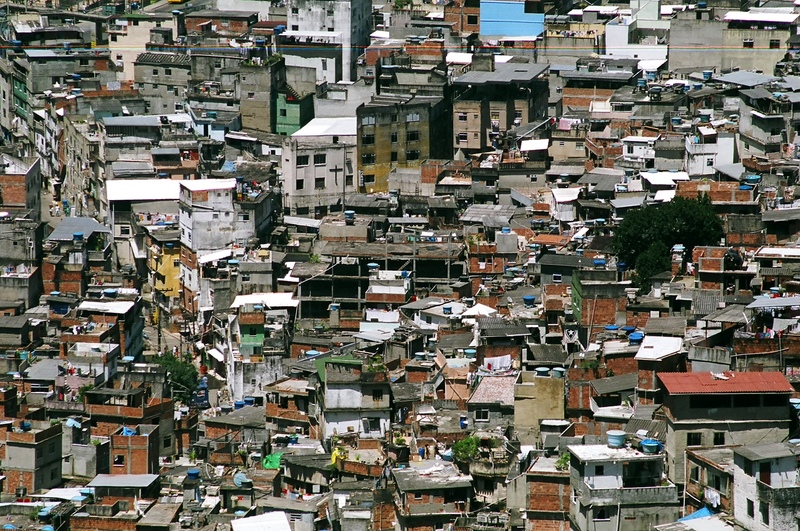 In this case Rocihna is build on the slope of a large hill and is said to be the largest slum in South America. The people of the favelas live in poverty but the slum is not totally devoid of certain amenities like electricity and some running water. 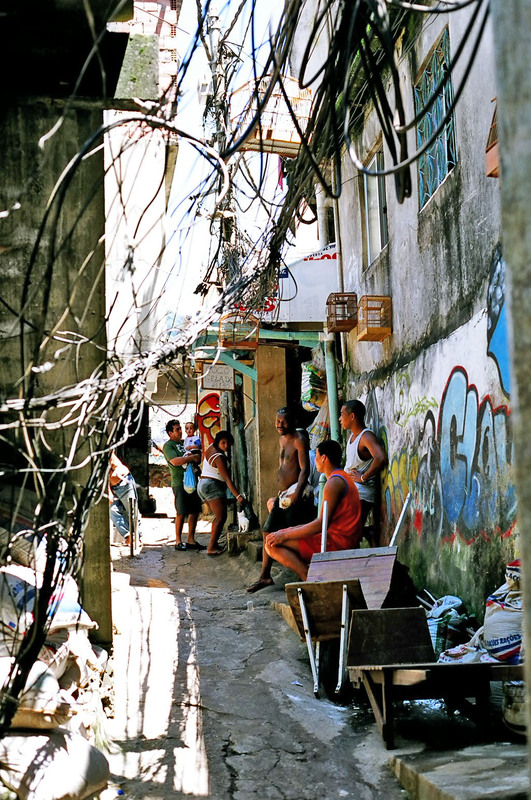 For instance, the power lines that run near the favelas are highjacked with pirated connection wires so that each power line has hundreds or low lying rigged wires running off like a mass of snakes, in this way much of the slum has access to electricity. Everywhere you go gang signs mark territory with graffiti. Children with bottle rocker firecrackers sit at the entrance road to the settlement and in the event that police are spotted they shoot the rockets into the air to alert the slum's drug lords that police are about. Elsewhere drug foot soldiers walk around with their own firearms. The tour was well worth it and the favela was in many ways one of the more photogenic places in Rio. My time spent in Brazil was quite a trip. 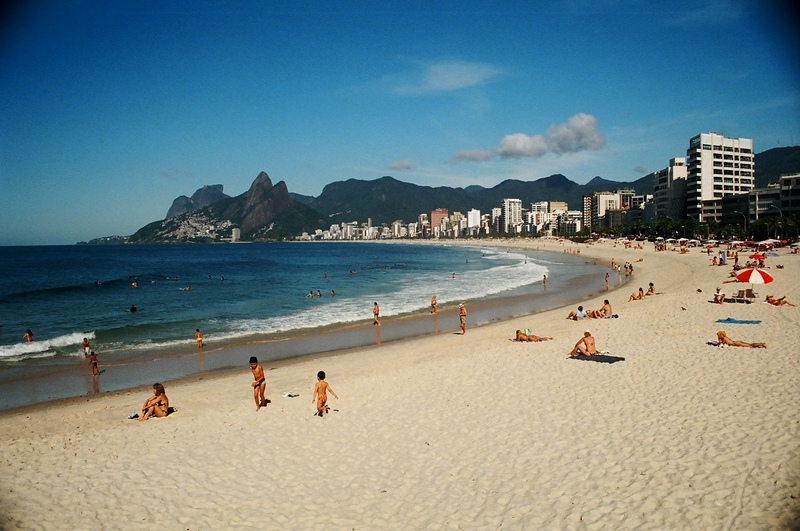 I hope to return one day and see the rest of Brazil.